On October 27, at the end of a two-day meeting that took place in San Cristobal de las Casas, the peoples and organizations that make up the Chiapaneco Group against the extractive model declared themselves “in resistance” to this capitalist model that “seeks commercialize the energy that life gives us, which comes from rivers, sea, sun, wind, forests and volcanoes. We do not agree with the fact that large national and transnational companies come to strip us of our lands and territories with extractive projects such as oil wells, geothermal energy, hydroelectric dams, mines and wind farms, to produce energy that feeds their polluting industries and the model of capitalist life of the big cities ». They denounced that “companies do not ask for permission from Mother Earth or even the people of Chiapas, when they want to extract the natural commons of our territories, with the complicity of the three levels of government, of the military, paramilitary and police apparatus” . They affirmed that, unlike what entrepreneurs want us to believe, “an energy that displaces peoples can not be green or clean”. On Monday 6th of July five of the seven indigenous tseltales, who are members of ‘La Otra Campaña’ from the village of San Sebastián Bachajón, were liberated due to the waiver of court action. The issue revolves around the existence of a legal body, which has the authority to remove charges attributed to those detained, as well as the ability to grant partial amnesty of the penalty charge. Gerónimo Moreno Deara, Alfredo Gómez Moreno, Miguel Demeza Jiménez, Sebastián Demeza Deara and Pedro Demeza Deara were imprisoned for three months, because of ‘actions in defense of the land’, according to the Centro de Derechos Humanos Fray Bartolomé de Las Casas (CDHFBC or Human Rights Center Fray Bartolome de las Casas). 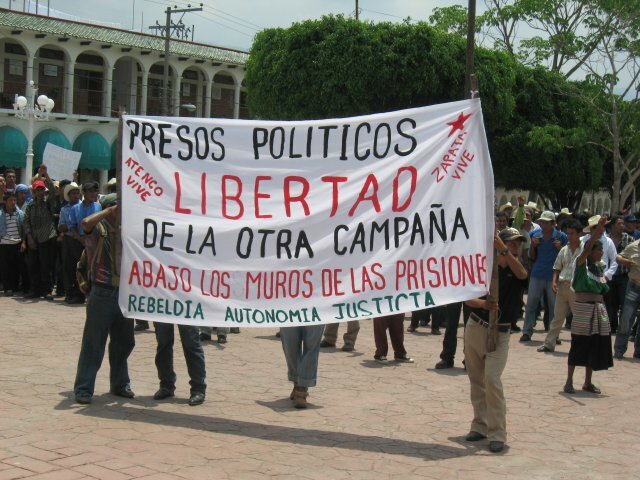 Furthermore, the brothers Gerónimo and Antonio Gómez Saragos, continue to be imprisoned in the CERSS number 14 in the “El Amate” prison in Cintalapa, ‘accused of violent robbery and organized crime’. On Thursday 9th July at 11.30am there will be a press conference in the offices of CDFBC to ‘inform about the conditions of release and about the current situation of the two members of the cooperative who continue to be imprisoned’.